U.N. Apologizes For Not Doing Enough To Stop Cholera In Haiti But Doesn't Own Up To Bringing It : Goats and Soda On Thursday, Ban Ki-moon apologized to the Haitian people: "We simply did not do enough with regard to the cholera outbreak." 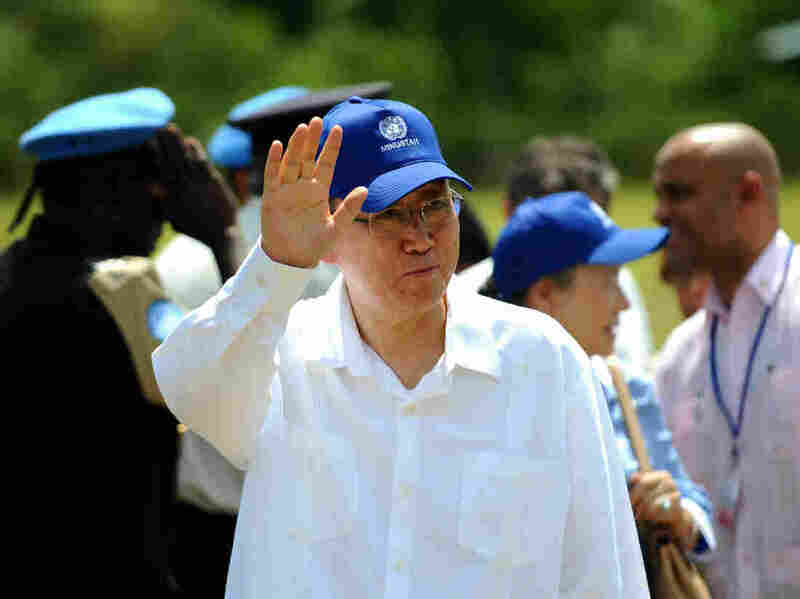 U.N. Secretary-General Ban Ki-moon, pictured during a 2014 visit to Haiti to inaugurate a sanitation campaign. On Thursday, he issued an apology that Haitians have been demanding for six years. For six years, Haitian activists have demanded that the United Nations accept responsibility for cholera in Haiti. Yet many seemed almost shocked on Thursday by U.N. Secretary-General Ban Ki-moon's apology for the U.N.'s role in the outbreak. Shocked — and pleased. Activists who have screamed on social media, protested in the streets and filed legal claims against the U.N. over the issue welcomed the secretary-general's new plan to address cholera in the deeply impoverished Caribbean nation: a proposal to pour $400 million into Haiti to fight cholera and compensate victims of the attack. Ban Ki-moon's statement also noted that "the preponderance of the evidence does lead to the conclusion that personnel associated with the [U.N.'s peacekeeping] facility were the most likely source." But he stopped short of apologizing for the fact that the bacteria was brought to the island by Nepalese peacekeepers and flowed out of toilets from their base in to a local water supply. For that reason, Philip Alston, the U.N.'s human rights special rapporteur, told The Guardian that Ban Ki-moon had made a "half-apology." Others were optimistic. "The U.N.'s promises are promising," says Brian Concannon, the head of the Institute for Justice and Democracy in Haiti, a harsh critic of the U.N. on this issue and one of the leaders of the legal campaign to try to force the U.N. to pay reparations to victims of the outbreak. U.N. peacekeepers inadvertently brought cholera to Haiti in 2010 just after the crippling earthquake. The outbreak, which is still ongoing, has sickened nearly 800,000 people and killed nearly 9,000. Prior to 2010 cholera had not been reported in Haiti in decades. Speaking to the U.N. General Assembly Thursday, Ban Ki-moon, said the U.N. deeply regrets the loss of life the outbreak caused. "On behalf of the United Nations, I want to say very clearly: We apologize to the Haitian people," the secretary-general said. "We simply did not do enough with regard to the cholera outbreak and its spread in Haiti. We are profoundly sorry for our role." Concannon, in a conference call with supporters of what his organization calls the "cholera justice movement," welcomed the apology and the proposed new funding. "But we need to fight even harder to get those promises fulfilled," he added. Even though the U.N. still has not acknowledged that it was involved in bringing the deadly disease to Haiti, activists were appreciative of Ban ki-Moon's words. "We asked for an apology and I really deeply appreciate the words from the secretary-general," said Junia Barreau, a Haitian activist based in Montreal. "Victims need these words. They asked for them and they got it. It's an accomplishment."